The ice age nearly 2 million years ago shaped our unique land and soil, and over the centuries, the moderating effect of the Atlantic Ocean has created vineyards unlike any others in the world. It’s only been recently though, over the course of the past 25 years that our modern wineries have especially flourished. Situated on one of the cooler climate limits for vines Nova Scotia’s soil and mesoclimates create some of the most distinctive premium-quality grapes in North America. Our wineries have garnered international acclaim for their efforts and genuine passion. Our warm summers and long falls create crisp wines with bright acidity and aromatic complexities. Constantly being recognized as distinctly Nova Scotian, the combination of these unique characteristics led to the development of the first appellation in the province, Tidal Bay, officially launched in June 2012. There are over 70 grape growers and more than 800 acres under vine in seven different regions across Nova Scotia: Annapolis Valley, Gaspereau Valley, Avon Valley, Malagash Peninsula, LaHave River Valley, Bear River and Marble Mountain, Cape Breton. 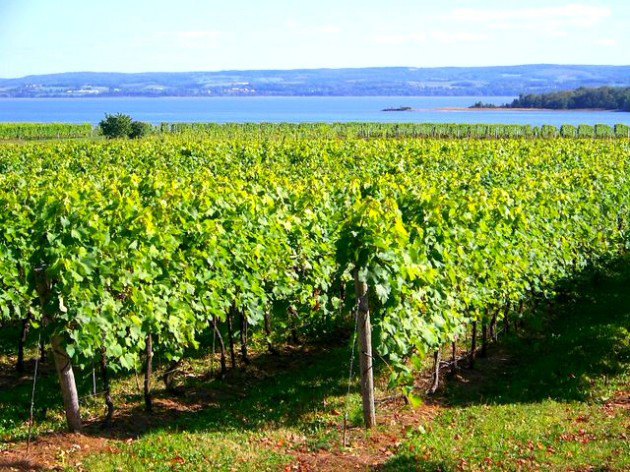 Officially launched in June 2012, Tidal Bay is the first wine appellation for Nova Scotia. A crisp, aromatic white wine, it displays the unique characteristics of our cool climate region and pairs perfectly with the local seafood we’re known for. The name Tidal Bay was inspired by the influence of the sea on all of the wineries located across the province. Although all Tidal Bay wines must follow the same set of standards, each wine is slightly different from one another, and wineries are able to uniquely express their individuality within their Tidal Bay wines. To obtain the Tidal Bay designation, all wines must be made from specific grape varieties, include 100% Nova Scotia grown grapes, follow a strict set of standards and be approved every year by an independent blind tasting panel. These standards were created by a committee of winemakers, sommeliers and wine experts and are strictly enforced throughout the winemaking process, from growing to bottling. Wines can be a combination of the approved grape varieties, but must demonstrate the distinctive taste profile that reflects the classic Nova Scotian style: lively fresh green fruit, dynamic acidity and characteristic minerality. Tidal Bay wines must also be relatively low in alcohol and no more than 11%. Look out Champagne: Nova Scotia may not have the history of true French Champagne, but over the past decade we’ve built up a wealth of expertise and specialization in traditional method sparkling wines. 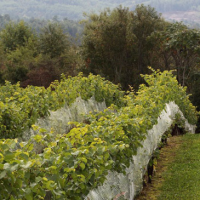 Nova Scotia has near perfect climatic conditions for making sparkling wines. The warm summers, complimented by the temperate influence of the Atlantic Ocean, create a cool growing season that encourages flavours to develop brilliance and uncommon intensity, while still retaining the all-important acidity required for balance and structure. Nova Scotia has become well known for producing bright, crisp and aromatic white wines with pronounced acidity and prominent character. Influenced by the same climatic conditions, they are the perfect complement to our world famous seafood, such as lobster, scallops and salmon. White hybrids such as L’Acadie Blanc, Seyval Blanc, Vidal and New York Muscat have had tremendous success in Nova Scotia and growing success has also been seen with vinifera such as Chardonnay, Ortega and Riesling. Because of our cooler climate and shorter growing season it’s often thought that Nova Scotia is unable to produce quality red wines. However, we’ve been fortunate to discover many grapes that grow incredibly well in Nova Scotia and produce well rounded, full-bodied and dry red wines with low tannins. These wines are typically earthy and smokey with berry fruit characteristics and pair well with gamey red meat and traditional hearty Nova Scotia stews. Varietals such as Lucie Kuhlmann, Baco Noir, Marechal Foch and Leon Millot grow particularly well in Nova Scotia. Nova Scotia is famous for its fruit. Our fruit wines, like some of their “sister” grape wines, are sassy and bold. Displaying a balance of light acidity and fresh ﬂavours, discover Apple, Arctic Kiwi, Blueberry, Cranberry, Elderberry, Pear, Raspberry and other delicious fruit wines. For many places around the world Icewine grapes can be a challenge, but Nova Scotia provides ideal temperatures for growing this unique luxury product. Made from frozen grapes, Icewine is usually harvested at night between late November and late December, when the temperatures hit between -8 °C and -10 °C. A cool, slow fermentation results in a very complex, full bodied dessert wine. The golden nectar is high in sugar, flavour and balanced acidity, and depending on the variety, displays notes of spicy tangerine, apricot and melon. Common Nova Scotia ice wine varieties are Vidal, Ortega and New York Muscat.